Okay. Eyes forward. This one is a must see for all LGBT youth, straights of every flavor, and actually, pretty much everyone. 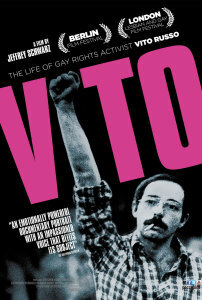 It’s a documentary called “Vito”, about the life of gay activist Vito Russo. A man, I am ashamed to say, I knew nothing about before watching this film. Sure, we know about Harvey Milk because he was shot to death in a very public way and Sean Penn got an Oscar being him. But Vito, who grew up in New Jersey and learned to be fully human in New York, died of AIDS in 1990. Yes, I gave away the ending because that’s not the big message here. And besides you would sort that out early on anyway. But this isn’t a film about AIDS activism. That is, until it IS a film about AIDS activism. It’s a film about being born gay, living out loud, and using your natural talents to gain the attention of the press—and Hollywood—to keep from disappearing into hatred. The big key to Vito’s success as an activist through the 60s, 70s, and 80s was he had unconditional love from his family. I don’t know about you, but in my world–gay, straight, or zebra–that ain’t always the case. All of his family was grateful for him until the day he died. Rare. And beautiful. “Politics you can dance to” was the most succinct description in the film of gay activism lead by Vito. He was everywhere, really everywhere—all over the world. And he knew everyone: Lily Tomlin, Liz Taylor, Armisted Maupin. Everyone wanted to know him because he was one of the first to stand up and fight back against the notion that being gay was somehow bad, sick, or evil. You might be thinking, “There are plenty of gays in stuff. I mean, just watch “Glee” on Tuesday nights. Who cares?” And this is where the history lesson comes in: Vito wrote a book, which became a film, called “The Celluloid Closet.” He was the first to compile from popular films the subtle touches and the not-so-subtle kisses caught between two men or two women. What struck me was his discovery that through the ages there were distinct trends: before 1933 gays were shown pretty openly as side characters, but between 1933-1961 they were only shown as subtext—glances, odd touches—because the Film Production Code explicitly called out gay behavior as absolutely forbidden on screen. So, after the early 1960s when gay characters were allowed again, they became some of the stereotypes we still see today: tragic characters who killed themselves, monsters, murderers, twisted villains, rapists, seducers. Gays were depicted at either ends of the extreme where men were often silly, frivolous clowns and women self-loathing criminals (I can think of some recent Oscar winners that follow this exactly.) A major theme was gay people were fully in charge of undermining everything good about America. In light of our LGBT youth committing suicide because they feel there is no hope, it is an outrage to think these stereotypes have continued to this day right on our silver screens. And Vito was the first guy to call attention to it. A final impression: There was a protest Vito organized at Harper’s Magazine in the 70s because of an interview that in part said, “If I had the power, I would wipe homosexuality off the face of the map” (you’ll have to watch the film to find out who said it.) It’s chilling how familiar all of this rhetoric is today. I totally want to tell you everything because it resonates throughout our culture, but I want you to see the film more. Let me just say this: Feather boas don’t always define the man wearing them. “Vito” will be presented at the Santa Fe Film Festival, Saturday, October 22, 2011 at 10:30 a.m. at The Screen on the campus of the Santa Fe University of Art and Design. Visit the “Vito” page for more info. Tickets are ON SALE NOW at ticketssantafe.org or call (505) 988-1234.